The poor little Dearborns were subjected to their very first bath yesterday. It had to be done. Their little bums were getting a tad crusty from all that diarrhea. They did remarkably well. I wouldn't go as far to say that they enjoyed it, but there wasn't a single peep or cry from any of them during the process. The blow-drying really floofed her coat up, and afterwards, when viewed from above, she looked like a thought bubble. Once everyone was clean, they cuddled close in their warm bed with fresh-from-the-dryer blankets and heating pad, and dozed off for the rest of the afternoon. They woke up screaming for their dinner. I put out the wet food, and in the feeding frenzy, everyone got filthy again. Kittens can't stay clean for long. I'm sorry I don't have more pictures to share. When bathing kittens, you have to move fast. You want them to be dry and warm as soon as possible, so I didn't want to pause for pics, and slow down the process. Ms Pearla was kind enough to pose for a quick pic. Thank you, Pearla. Even wet, you're pretty dang cute. That is the funniest most pathetic kitteh picture I've ever seen. Poor baby Pearla. I love her little pink paws! I'm totally giggling at the picture. I'm sorry, was there a post after that picture? I got so distracted by the perfectness going on.. It's always such a shock to see how small a floofy cat is when wet! Okay I am officially cheered up. Was feeling low and now this adorable soggy baby Pearla. How can anyone not smile! Cute explosions! My heart melted just a little bit there, ok quite a lot. Too funny...we have had kittens like this and it seems like a contest to see how quick they can get into something once they are clean. Though even wet they are adorable!! Oh my... seeing all your past precious kitty photos, I seldom have thought about all the practical things that are involved in caring for these little bitties. You can't help but get all distracted by their cuteness. Bless you for all you do for them both seen and unseen. I love you as much as your little charges. Still cute, no matter what. This is so funny cute !! -- little Ms. Pearla seems to be thinking "After the blow dry can I have my nails done, too". Laurie you are the best picture taker !! Thanks for the chuckles. Adorable, though they always look like they've been terriblely mistreated. Althought mine after the first bath always purred through the 2nd bath. My oldest cat who I lost in october took a shower with me everynight. Ms. Pearla looks so different when wet - she does look like a little gremilin, and a very cute one at that! One of your very best posts ever. That photo!! Can't wait to see the fluffy thought bubble. What a funny and cute picture! Of all the cuteness in the photo, it's the little teensy drop of water dripping off her little teensy chin that just slayed me. So, so precious! I cannot imagine bathing five kitties, either; you are a brave woman, Laurie! But clearly the babies know they're in good hands already. SO CUTE!!!!! Our cat came to us as a crusty, stinky kitten so he got two baths (bum required an extra bathing). Then they're so sweet and fresh smelling, it was worth it. It's hard to believe this is the same precious darling we met the other day. Laurie, you do so much work behind the scenes, and we all appreciate it more than you know. How do you bathe them? I have a kitten who smells like she's been rolling in the litter box and was thinking I needed to bathe her - but just don't know how to go about it! Pearla is just flat out precious - even wet. I love both her and Sheldon best in this bunch but I love them all!!!! Pearla is a darling little one. Was the heating pad because they'd just had a bath, or do they always use one? Or maybe it's cold up there today? The heating pad part surprised me. Anon- I bathe them in the sink. Elaine, It's pretty cool around here. Our summer weather hasn't kicked in yet, so bath or not, I like to keep them warm. I didn't even reach 60 degrees today. Little cute kittens. It looks like they are enjoying bathing. I love these kittens. Awww, poor little Pearla! 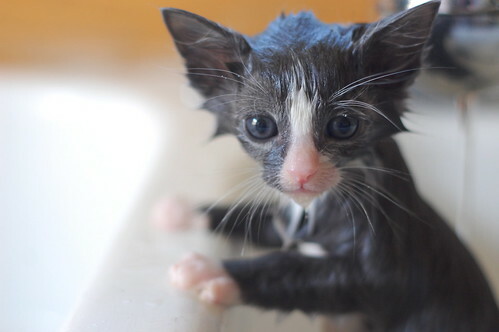 Hardly looks like the same kitten all wet like that - but still so cute!